If you visit a medieval castle, medieval church or medieval priory, you will often come across stone carvings both inside and outside the buildings. The carvings can vary in size and style and, indeed, the purpose for which they were made. Some medieval stone carvings are of strange-looking faces such as can be seen inside Caerlaverock Castle in South West Scotland. We took this photograph (left) on the ground floor of the castle in what had once been a room with a fireplace. 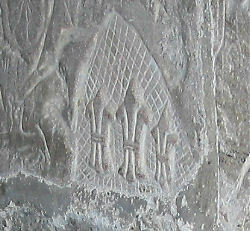 The carvings were quite small and in vertical blocks so obviously served as some kind of ornamentation. Others carvings you might find elsewere are of creatures or flowers though some are the marks left behind by men who were captive there - either imprisoned or who lived and worked there. Such is the case with a most unusual set of medieval carvings in a stone wall within the keep of Carlisle Castle, one of the finest medieval fortresses in all England. We were lucky enough to see these first hand and here is one of our photographs (right). Now protected behind a glass door, it is not known exactly who made the carvings though some believe they were made by prisoners. What is known is that they were made in the late 1400's. Some of the carvings are detailed and ornate having been done with great care and skill whilst others are extremely basic with little skill having been employed. Essentially the whole wall is a wonderful piece of medieval graffiti. 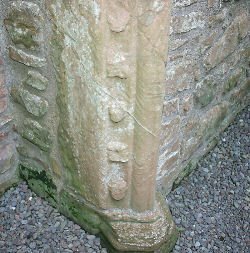 The Lanercost Cross is an entirely different piece of medieval stone carving. Located within Lanercost Priory (its stump remains in the grounds outside), is the shaft of a stone cross with an inscription in Latin dating back to 1214. To learn more just visit our Lanercost Priory page where you can also enjoy an exclusive piece of video featuring music by Stephen Caudel.